Leaving Interstate 70 and traveling down Highway 6 you find yourself surrounded by posh timeshares and luxury mountain condos in the towns of Dillon and Keystone. Yachts and sailboats sit in the bays of Lake Dillon, and everywhere on this path you are surrounded by modern comforts and conveniences. Prices here are adjusted accordingly as well- prepare to pay 30% more for anything from fuel to food in these parts, it’s just part of “the charm” of trendy mountain ski communities, and if you wish to “see and be seen” you pay for it, summer or winter. But travel just past Keystone, and the modern world and it’s high-pressure, in-your-face angst quickly begins to fade. A careful eye can pick out bears foraging through the landfill, and once in a while they come lumbering clumsily over the hill and down towards Highway 6 escaping the clanking mechanical tractors pushing in another day’s worth of trash. Just beyond the landfill, the road splits, and heading right on to Montezuma Road you begin a rapid descent back in time. 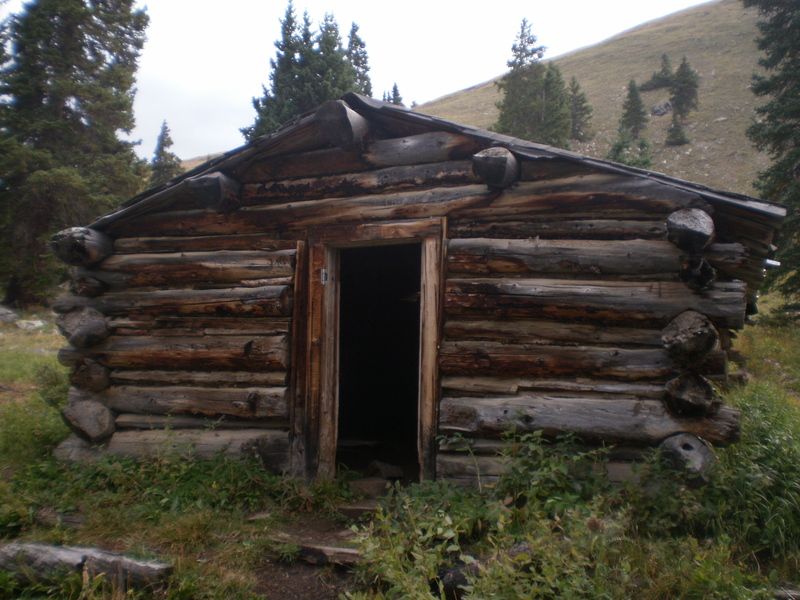 Montezuma is a small “almost” ghost town that has somehow managed to survive for well over 100 years in a cold high valley south of Keystone. Montezuma has survived the booms and busts typically associated with mining, and several fires that have burned much of the old, original part of the town. A few original buildings from Montezuma’s first incarnation survive, a few more from after the first fire, a few more from after the second fire, and a few more of newer, more modern construction. The town’s population is an eclectic mix of the wealthy, hippie dropouts choosing to live a simple existence off the grid, rugged, cranky prospectors who trace their roots back to the first inhabitants of the “first Montezuma” who still hump the dream of striking it rich…because they know they will, someday, and at this point, there is no other option- their fates are tied to Montezuma, and lastly, as is the norm in all off the beaten path mountain towns, a handful of artists. Montezuma is a neat place well worth a visit, but it is what lays above Montezuma that brought me here. A rugged 4X4 trail, about halfway through Montezuma shoots up the side of a mountain in a series of switchbacks. This is the old Saints John Road (Yes, SAINTS John, that is the correct name) that leads to the ghost town of the same name. 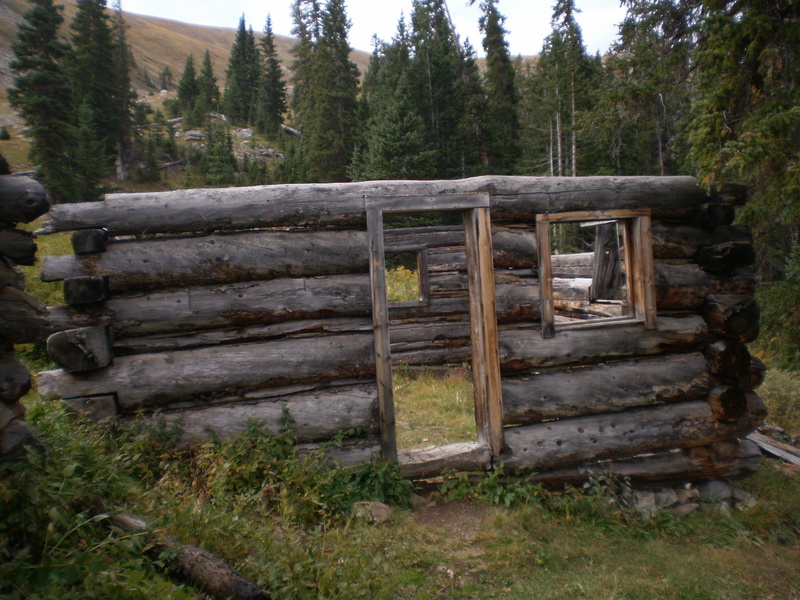 A few cabins dating to the 1860’s still stand at Sts. John, high above Montezuma, and 2 or 3 people still spend their summer’s here, but mostly Sts. 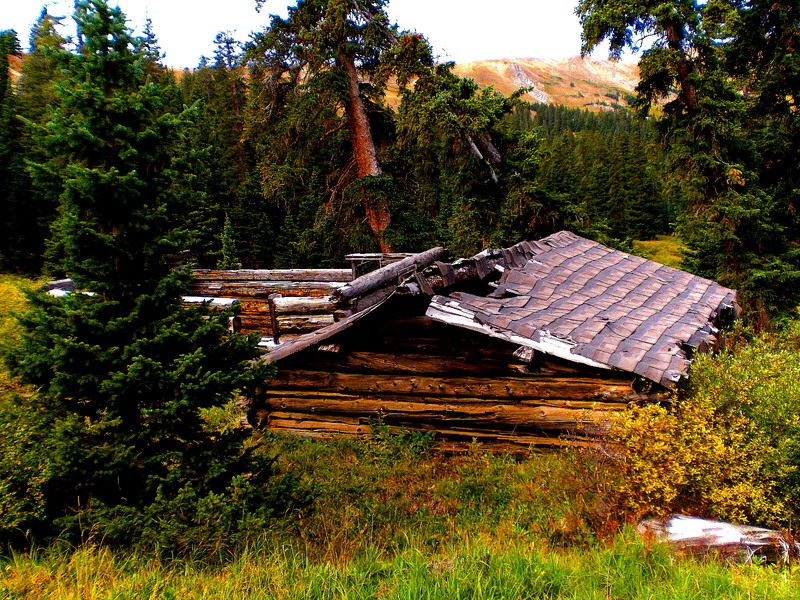 John is a pile of toppled buildings and lumber drowned in an ocean of shrubs, pine and willows that have overgrown the area in the last 100 years. It is hard to imagine a town once stood in this dense rat’s nest of undergrowth and overgrowth and growth all in between. A giant mill once stood here, but today is just a scrap heap of sun-bleached boards and crumbling bricks. The remains of the red brick chimney mark the oldest smelter in the state of Colorado- stubbornly clinging to the side of a hill just behind the collapsed mill, it was built in the 1860’s with bricks and bricklayers shipped all the way from Wales! 150 years down the road, the chimney is a testament to their quality work, in a town otherwise erased by time. The few who make it up this way often pass by without noticing it, and I scanned the mountainside for quite a while until I picked it out among the rocks and trees. But I didn’t come to see Sts. John, still higher was my objective. 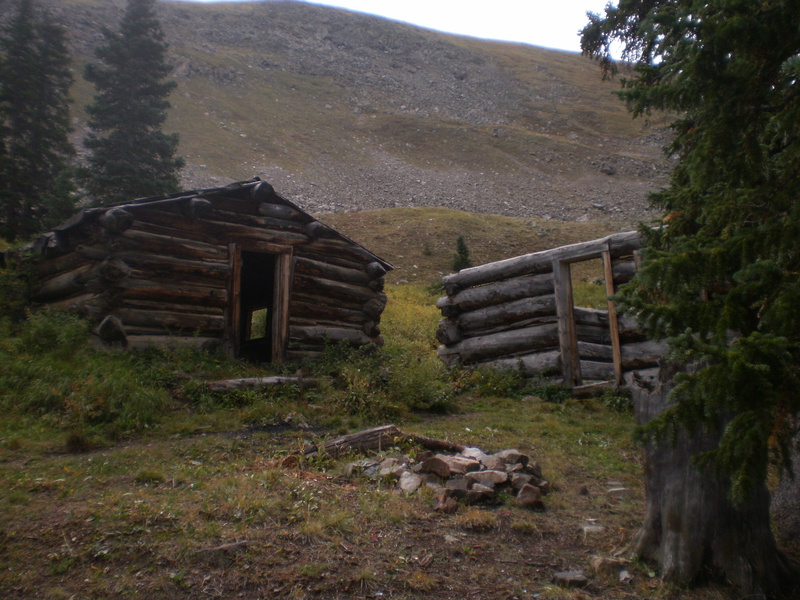 Continuing on up the side of the mountain, I climbed the rapidly worsening 4X4 trail in search of an 1870’s era silver mine and it’s corresponding camp known as “The Wild Irishman”. First I came across a lone miner’s dugout carved into the side of the mountain next to a small creek where the land had been worked long ago in search of riches. 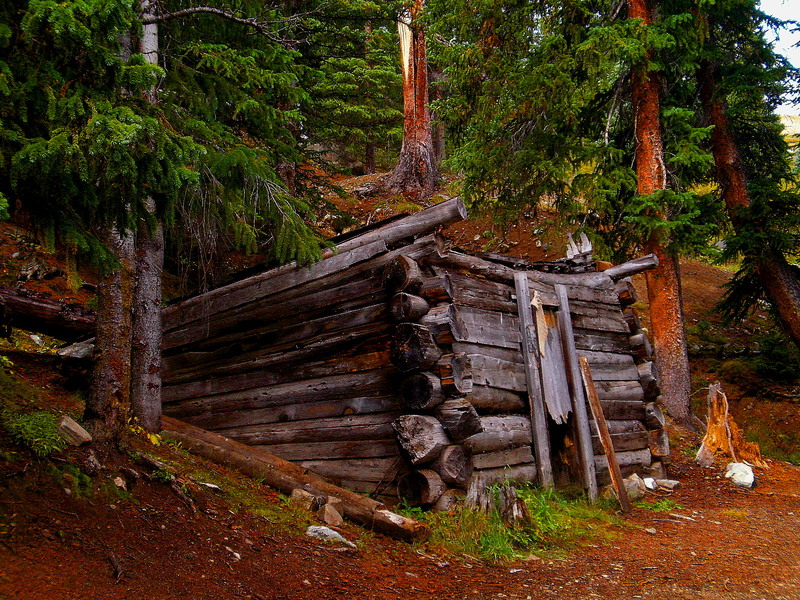 This dugout was surprisingly intact considering it dated from the 1860-1880 era. 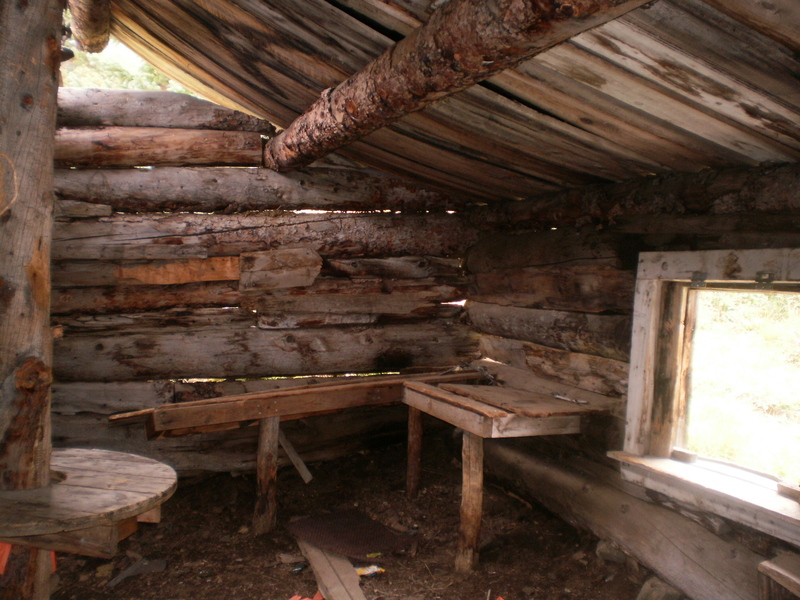 There was, of course, some modern garbage inside the dugout, indicating that people still use it occasionally for camping. 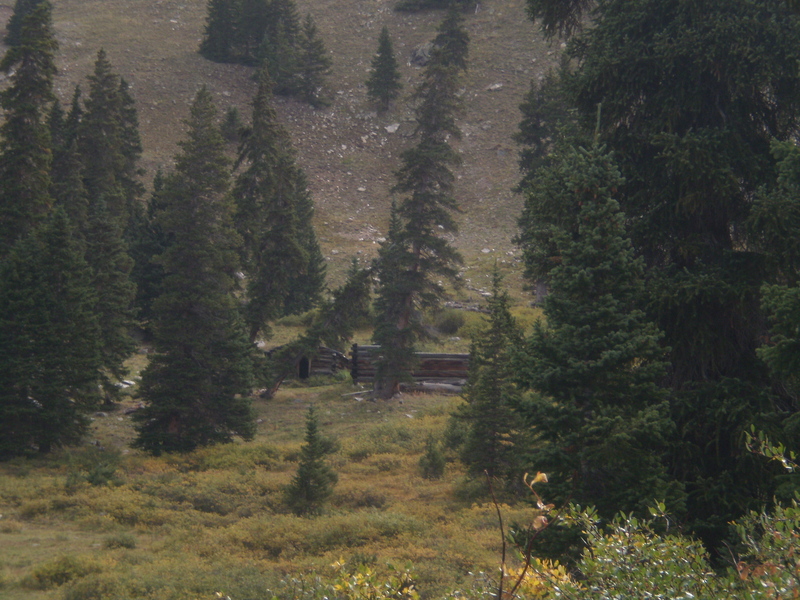 After leaving this isolated dugout, I climbed higher up the side of the mountain until, just at timberline, the long forgotten “Wild Irishman” settlement emerged in the last stand of trees below the tundra. 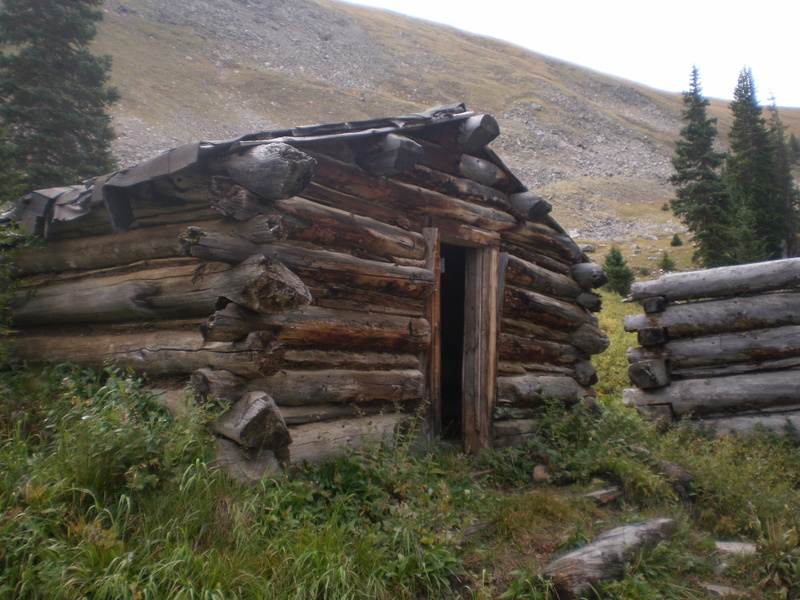 Three or four cabins remain there today, a couple in remarkable condition, as well as an old outhouse that has oddly been painted red by someone in recent years. 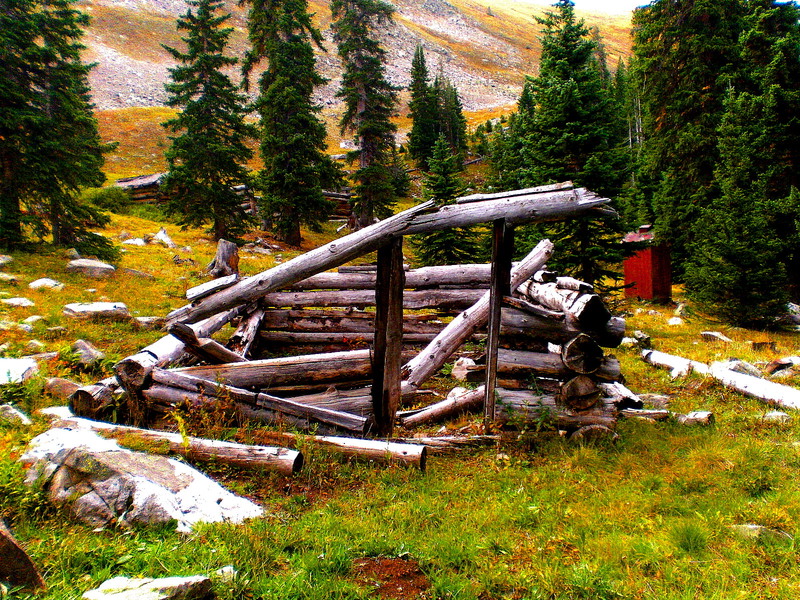 Collapsed cabins and mine buildings are found buried in the shrubs, and a giant tailings pile marks the site of the Wild Irishman silver mine. Only a few people visit this site, mostly 4X4 enthusiasts on their way to the summit of Glacier Mountain. You aren’t alone when you find the Wild Irishman however, deer, chipmunks and mountain goats roam the area, and are so unaccustomed to humans that they show no fear whatsoever. 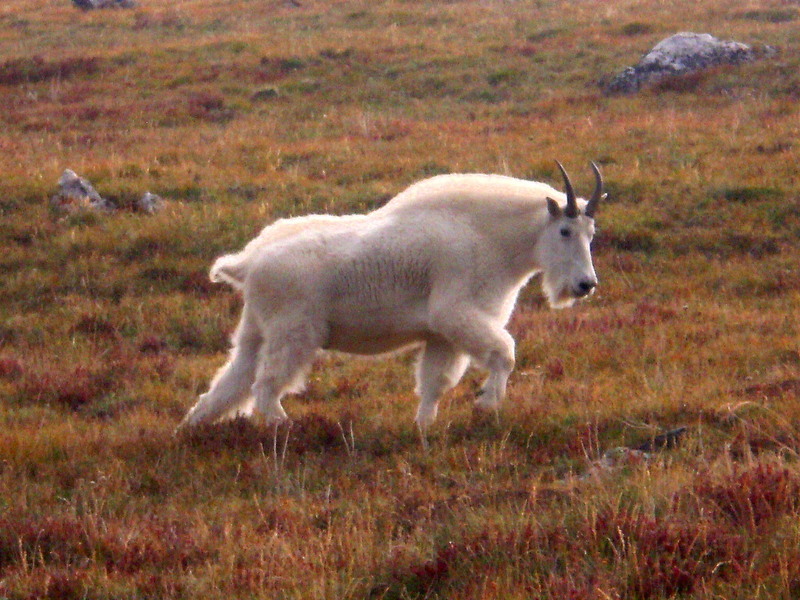 I was shocked when a giant mountain goat appeared high above the tailings pile at the mine, and slowly made his way down the side of the mountain to come investigate me. 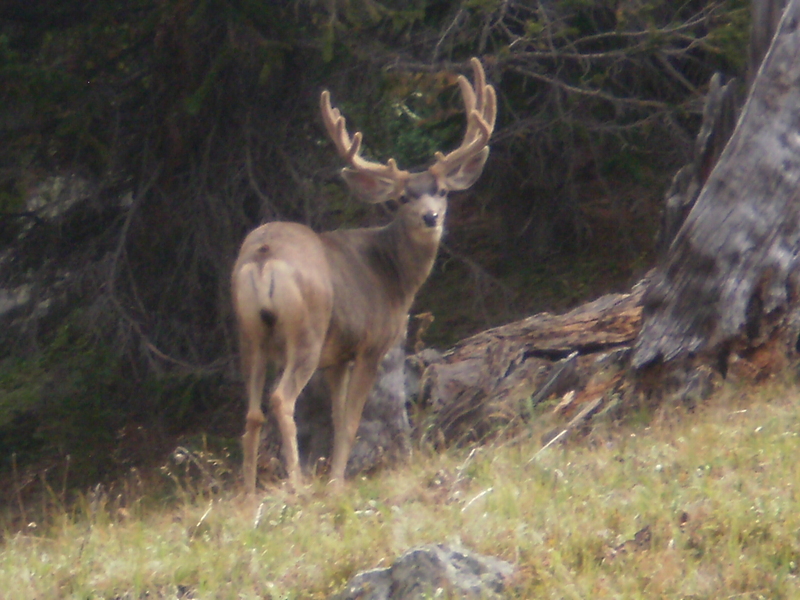 He showed no fear or aggression at all, he was simply curious and calmly walked over to within 10 feet of me. 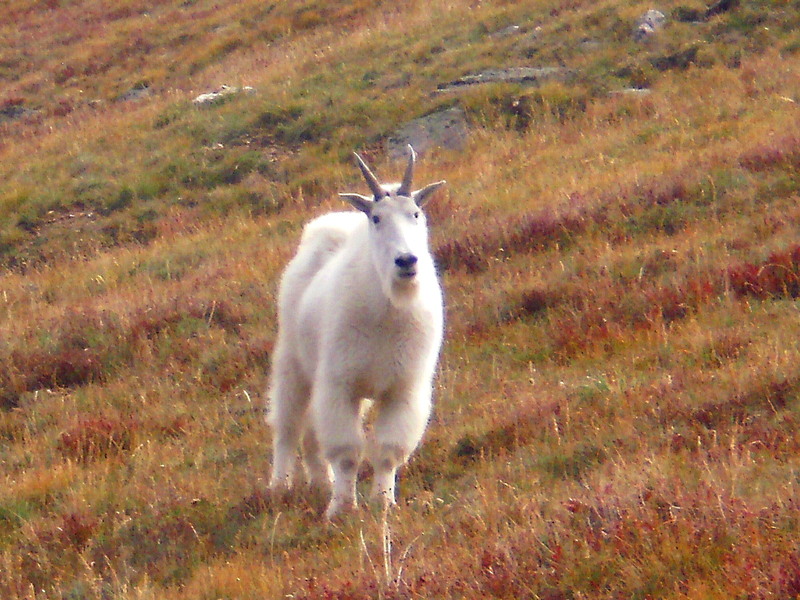 He sniffed the air and looked at me, grazed a little, posed for some pictures, then turned and climbed back up the side of Glacier mountain. Montezuma, Saints John and The Wild Irishman made a for a wonderful outing, but the mountain goat who came for a visit will go down as one of my fondest memories. The gate keeper of “The Wild Irishman” who guards the road. 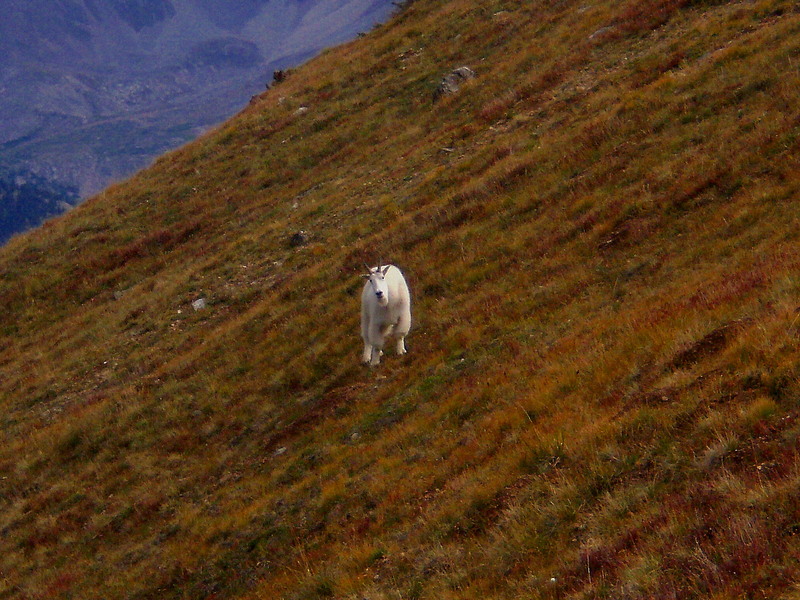 The mountain goat stopped and stared at me and sniffed the wind. My friend turning and heading back up the mountain after his visit. 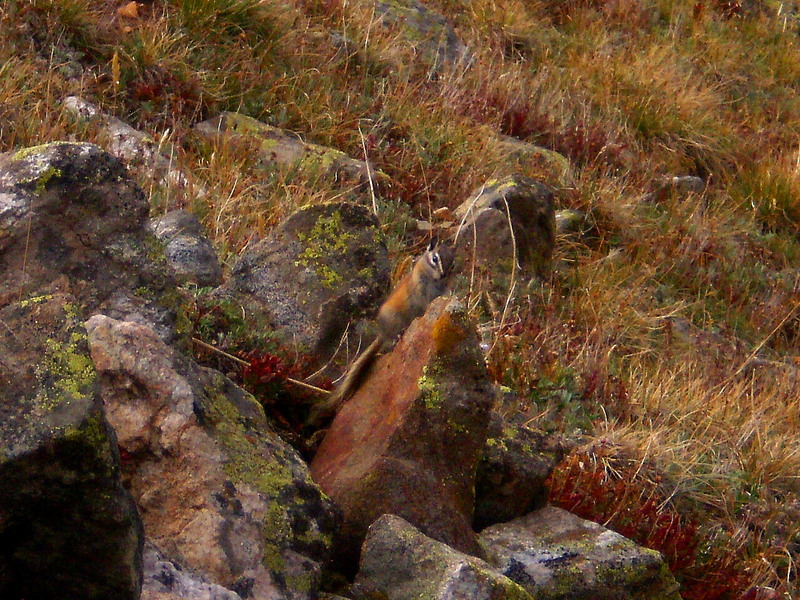 A busy little chipmunk who carefully watched me from atop his rock. We were at Sts. Johns trying to find Wild Irishman. Took a photo of the blue sign saying town and elevation and then went a little farther up the main road. — there was a fork in the road — to the right crossing the creek was a person’s little home with flowers etc. and to the left the fork said it went to private property called Lodemaster or something like that. Could you please tell me if either of those forks is the fork to Wild Irishman. I ran into some confusion at that point too. There are two forks at Sts. John- one that turns left and on to the clearly marked private road to Lodemaster, then if you take the fork over the creek you will drive alongside the old home you mentioned, there will be several other old homes buried in the growth behind it (it looks like you are on private land while in Sts. John, but the road does continue through) but stick on that road, and you will climb out of Sts. John towards Wild Irishman. A mile or two above Sts. 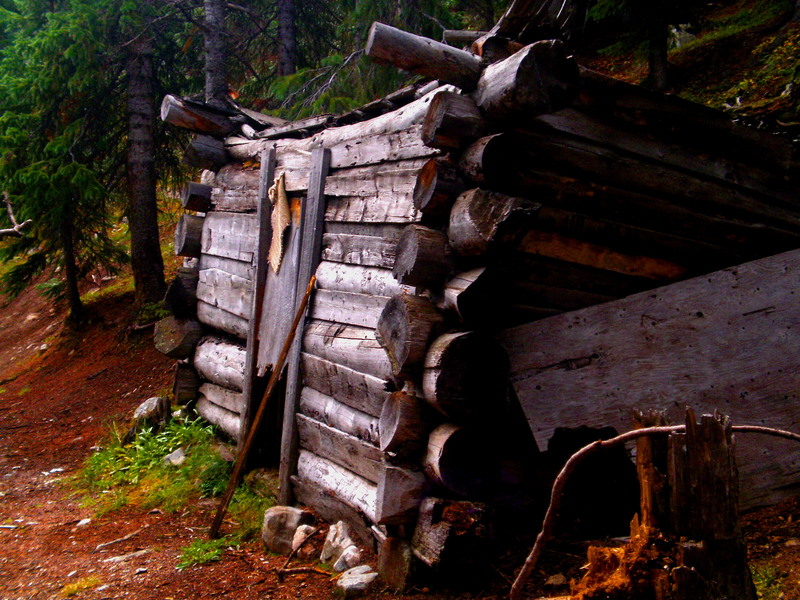 John there will be another fork- the right fork will lead you to the old dugout cabin in my pictures where the road dead ends, the left fork will zig-zag up the side of Glacier Mountain and right at timberline Wild Irishman will appear. It’s a rough road in several spots, but well worth the ride once you make it. Hope you find it next time!